1. Who Created School Sports Sites?2. How Does School Sports Sites Benefit Coaches?3. How Does School Sports Sites Benefit Runners?4. How Does School Sports Sites Benefit Parents? 1. Who Created School Sports Sites? Derek Miller originally created School Sports Sites as a website for the Yorkville Middle School cross country team that he began coaching in 2008. What started as a simple website became a full-fledged web app in 2009 and Derek started School Sports Sites in 2010 to let other coaches benefit from the app. Derek is the webmaster of Yorkville CUSD #115 in Yorkville, Illinois where he also teaches high school computer classes. He started coaching the middle school cross country team in 2008 and is also currently an assistant coach for the Yorkville High School track team. You can contact Derek at derek@sportssites.us. 2. How Does School Sports Sites Benefit Coaches? Coaches will find a number of benefits to School Sports Sites. The cost of a School Sports Site is comparable to web hosting, and less than competitors. School Sports Sites provides a number of ways to keep in touch with athletes and parents including email blasts, news, and a built-in schedule. School Sports Sites lets you keep track of uniforms, registration forms, and other information about your athletes. School Sports Sites can store contact information for your athletes and you can email an individual athlete directly from your site. You can earn a number of credits to lower the price of your School Sports Site including submitting bug reports, referring other coaches, and liking School Sports Sites on Facebook. 3. How Does School Sports Sites Benefit Runners? 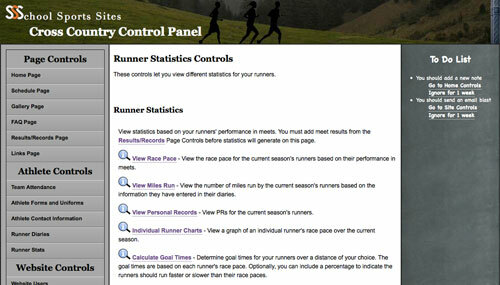 Runners benefit from a number of cross country-specific features included with the cross country version of School Sports Sites. A built-in runner diary lets athletes keep track of their mileage and race results. The results page lets athletes see team meet results and as well as individual P.R.'s. 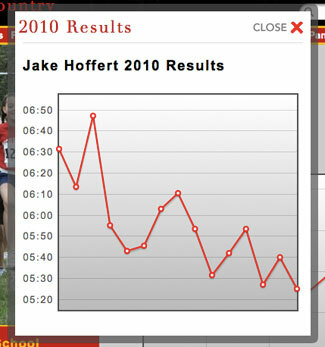 Each runner has an individual results page that shows all their meet results, P.R. 's, awards, and performance graphs. Runners can communicate with each other and the coaches using the comment system. Runners can see their photos used throughout the website including the slideshow and record page. 4. How Does School Sports Sites Benefit Parents? Parents benefit from the numerous communication options provided with a School Sports Site. Parents can sign up for a mailing list to receive email blasts from the coaches. Parents can view the team schedule and a calendar. 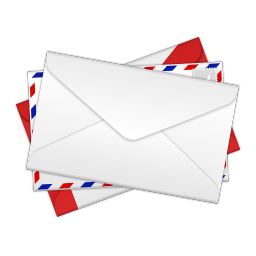 Parents can receive emails from the coaches if their athlete has not turned in their uniforms or required forms.